Surry Hills' strong 'working class' and commercial history produced a high concentration of pubs during the early 1900's and quite an unsavoury reputation. Oh my, times have changed. With its convenient inner city location, Surry Hills is now attracting relatively affluent residents and white collar workers to these wonderful old recently revamped pubs of yesteryear with some very cool food and drink specials. 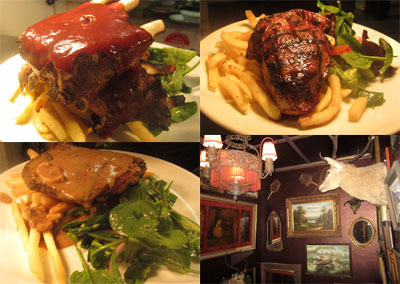 Surry Hills favourite pub dishes. I decided to sus out the best great value main meals for $12.50 and under. How do they do it you ask? Well here is how it works. Pub profits come from the liquid gold; drinks. So offering great cheap meals, they draw in a regular clientèle and what do you do once you get there? Drink. So it can be a great cheap night out. Depending on how much you down the liquid gold, of course. In the past, pub meals were a bit 'how you going'. These pubs have stepped up with some really great value for money menus using pretty darn good quality ingredients. Within a short 5-10min walking distance from Central Station, you can grab a really cool, hearty meal for $12.50 and under. Bargain! If you are really savvy, time your dinner with their various drink specials. Shakespeare Hotel - 200 Devonshire Street. $12.50 mains. One of the original great pubs is now heritage listed. Shakespeare retained its original old world look for which it is famous with their recent refurb to the six cosy up and down stairs dining areas. Eclectic old photos and décor adorning the stairwells are a must see. You could spend an hour or more exploring their antiquity. The hotel can get quite busy creating a fun atmosphere that spills out onto the footpath later in the night. It has won numerous pub food awards over the years and offer great drink deals on various nights to cash in on more value for your dollar. A great traditional pub affectionately known as 'The Shakey'. 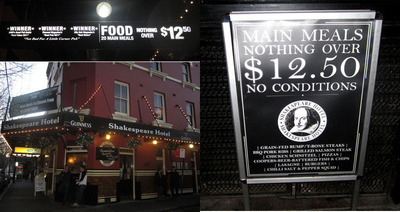 Shakespeare Hotel. Good old pub food at its best with multiple awards to prove it! Most popular meals: BBQ Pork Ribs & Chicken Schnitzel. Menu: 25 main meals include: Grain fed Rump Steak, BBQ Pork Ribs, Salmon Steak, Chicken Schnitzel, Chilli Salt and Pepper Squid,Coopers Beer Battered Fish and Chips, Lasagne. 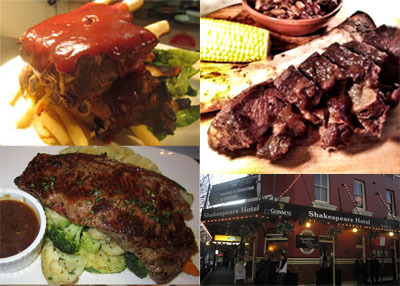 Original pub food at its best, big and hearty sizes are such great value. Recently included paintings and antiquity from the early 1900's adorn the stairwells, are an interesting see. Dove and Olive Hotel - 156 Devonshire Street. $12.50 mains. This hotel gave birth to a name change formerly Clarenden Hotel and fresh modern spruce up this year, adjusting to the new clientèle. Engaging celebrity chef Jason Roberts to create a very scrumptious interesting menu, adding a modern take to great pub food. Their fresh décor and young staff brings a bright and lively mood to your night with some very cool live jazz music on Sunday nights. Indoor and outdoor seating available. It is still early days and will soon include $5 meal specials throughout the week. Stay tuned or make multiple visits to take advantage of their exciting food. Dove and Olive Hotel's designer chef's menu suits its new modern make over. 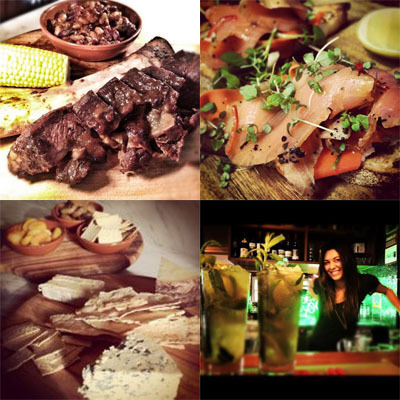 Popular Drinks Deals: 2 for 1 Mojitos Thursday to Sunday nights. Happy hour 5-7pm. Most popular meal: Ribs with Mexican beans and corn. Menu: Daily blackboard specials include: Pasta with mint pea and goats curd, Parmy with eggplant, smoked mozzerella and hand cut potatoes, Pork sliders with onion rings, Burger with ships and relish, Salt and Pepper Calamar, Pizza of your choice and a good Sunday roast with veggies. Crown Hotel - 589 Crown Street. $10 mains. Crown Hotel's modern refurb bought together the best of both worlds with their traditional and contemporary pub dishes to please a wide customer base. Traditional pub events include meat raffles, members badge draws and big screen TV's ensure large excitable crowds with sports and footy matches screenings. Standard menu with some mouth watering daily specials. Note: their only condition is to purchase a drink with your meal. You are going to order a drink anyway, so it's really not a condition. They have great Mexican Monday night. see full review for other great nightly food and drink specials. Indoor seating only. Popular Drink Deals: Members Happy Hour 8am-8pm. *free to become a member. 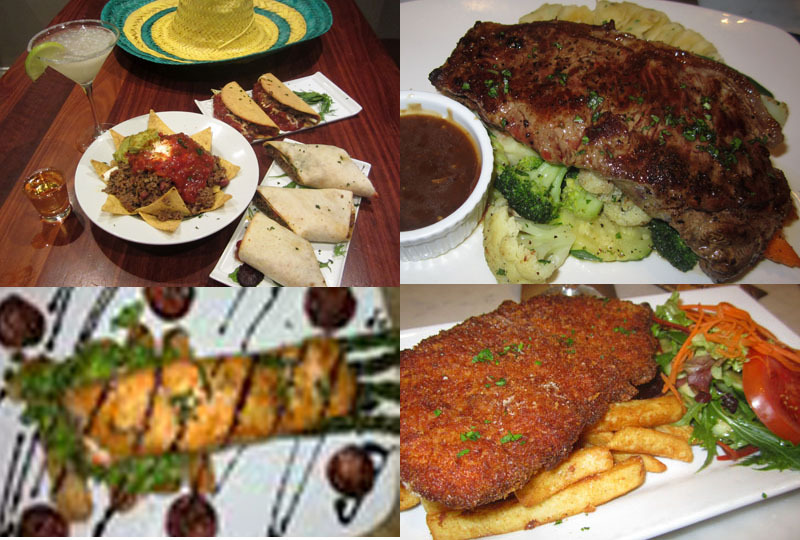 Menu: 300g Black Angus Steak, Pasta of the Day, Ravioli Neapolitan, Chicken Schnitzel, Warm Beef Salad, Portuguese Chicken Burger, Daily Specials can include: Atlantic Salmon,Lamb Shanks, Beef and Vegetable Pie, and many more daily blackboard specials. Crown Hotel $10 Main meals. Crown Hotel's $10 mains are excellent value, standard mixed menu of traditional pub food and modern dishes with daily blackboard specials. Fantastic to get together with work colleagues for a bit of bonding after work or have a casual meet up with friends. Excellent location to grab a meal before you head off to the Belvior Theatre. Please take note guys, I know it's a bargain, but these are not the places to take a date to have a romantic dinner.